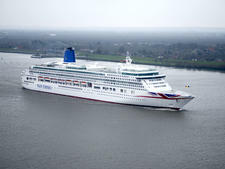 P&O Cruises' newest ship, Iona, will launch in May 2020. 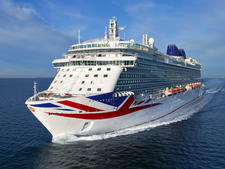 Details are being gradually released for what will be the biggest-ever ship purpose built for the UK market -- since P&O Cruises' last one, Britannia, which launched in 2015. Iona will be joined by an as-yet-unnamed sister ship two years later. 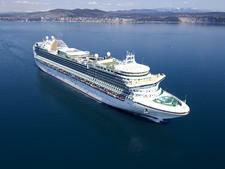 The 5,200-passenger, 180,000-ton ship is one a number of new ships ordered by parent company Carnival Corp. that will run on Liquefied Natural Gas (LNG), making it the cleanest-ever P&O Cruises' ship, too. As with all the rest of the ships in the fleet, the emphasis will be on food, drink and entertainment -- U.K.-style. So don't expect climbing walls, bumper cars or waterslides, but do expect celebrity chefs, revue-style shows and plenty of bars and pubs. And in a first for the line, the new ship will also pioneer a half-mile "Lanai" deck -- an outdoor, covered promenade which will include al fresco restaurants and bars -- "bringing the outside in," or "connecting passengers to the sea," as Carnival U.K.'s CEO put it. In terms of features, the focal point of the ship will be the Atrium, as it is on Britannia, except the Atrium on the new ships will feature glass panels, flooding the space with natural light. There will also be a grand staircase, a gallery and overhead walkways. There will be a giant dome above called SkyDome, which will be one of four entertainment spaces on the ship and will feature aerial performances, projections onto the roof and immersive shows. 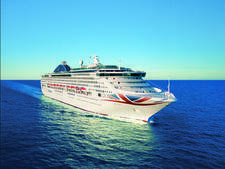 The ship will also feature 30 eateries including seven speciality restaurants (current flagship Britannia has just three); and a similar roster of celebrity wine and food partnerships as Britannia -- Michelin-starred chef Marco Pierre White, master patissier Eric Lanlard and Alex James, of Blur fame, and now better known for cheeses. It will also have 12 bars, 13 entertainment venues, three pop-up entertainment spaces/venue, four swimming pools (three outside and one inside) and 16 whirlpools. P&O Cruises has recruited a number of architects and designers to draw up the initial designs, which includes the designers behind British Airways' flat beds and Air France's first class. The line has also re-recruited Richmond International, who designed the whole of Britannia. 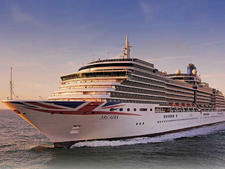 the ship will feature more than 4,000 pieces of art, the majority hailing from the UK. 95 innovative Conservatory Mini-suites featuring an additional lounge area with floor to ceiling glass and sliding door between the main cabin area and balcony. These come in at 274 square feet. 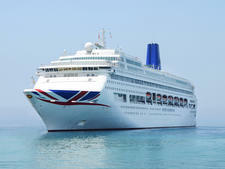 In a radical move for the line, P&O Cruises is scrapping set time dining, allowing passengers complete flexibility on when, where and with whom they eat in the main dining rooms. 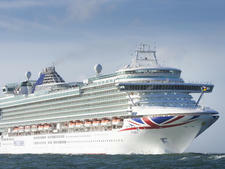 There will be a total of 30 places to eat (including pubs and bars) onboard. Old favourites Sindhu (minus the Atul Kochhar link-up); fine-dining restaurant Epicurean and The Glass House -- the Olly Smith-designed wine/tapas bar popular across the fleet -- all return. The In terms of entertainment, the SkyDome, a glass dome at the top of the ship's atrium, will be the hub of action onboard. It will house the "hidden" 710 Club, reminiscent of a Covent Garden nightclub, complete with a cocktail bar; four-screen boutique cinema Ocean Studios, offering both classic films and new releases, as well as the latest in sound technology; and a pool with a retractable stage. The space will also be used for dining, relaxing, deck parties and music (live and DJ-spun), as well as aerial performances and other immersive shows. Another popular spot across the fleet will be Brodie's Pub, which will also be on Iona. And in a first for the line, it will also feature a gin distillery onboard, distilling its own brand tipple. There will also be a gin bar, serving 30 different types of gin. We know that Iona will have four swimming pools (three outside and one inside) and 16 whirlpools. The ship will feature a selection of new-to-the-line spa feature spa and fitness facilities, including destination-themed treatments, infinity whirlpools and a salt steam room. The spa will also feature a retail boutique selling skin, body and hair care products. Destination-themed treatments are set to include "Nordic Cleanse," a detoxifying treatment incorporating acupressure back massage and a warming body and face mask, and "Baltic & Ice Massage," which is a deep tissue massage using warm and cool stones. Iona's spa will also feature the line's outdoor The Retreat that will offer cold flannels, chilled drinks, snacks and alfresco spa treatments available in the privacy of cabanas. The fitness centre will also offer six new classes, including TRX suspension, which is training to develop strength, balance, flexibility and core stability; Functional training/HIIT, which is a cardio-based workout; a meditation and breathing class, and Group Cycle Connect and Skillrow. Iona will sail its inaugural season from May to September 2020 exclusively in the Norwegian fjords, offering seven-day roundtrip cruises from Southampton to Geirangerfjord, Stavanger, Alesund and Olden. During it's first winter season the ship will sail a mix of Spain, Portugal, Canary Islands and Northern European itineraries.